Enhance Muscle Protein Synthesis: Leucine in particular triggers what’s called the mTORC1 signalling pathway, an essential step in muscle building. Increase Fat Burning & Support Fat Loss: Higher BCAA intake has been linked to improved body composition. It is believed that leucine increases energy expenditure and fat oxidation, while isoleucine improves glucose tolerance. BCAA Supplementation can Support Hormone Balance: high intensity training can raise cortisol, which can negate your gains; but studies have shown that BCAA supplementation can improve testosterone to cortisol ratio, lower inflammation markers and improve recovery times. BCAAs Enhance Endurance & Lower Fatigue: BCAAs can be burned as energy to maintain ATP energy levels during rigorous exercise; and valine in particular inhibits uptake of tryptophan into the brain which can slow the production of serotonin. This is the neurotransmitter that signals fatigue, and can shut you down mentally. BCAAs can Lower Muscle Soreness: Several studies have demonstrated that supplementation with BCAAs can lower post-workout DOMS (delayed onset muscle soreness). The net result is a quicker recovery so that you can train more frequently for more gains. Prevent Muscle Loss: even in the absence of exercise, BCAAs can trigger protein synthesis and help preserve muscle tissue while preventing fat gain. BCAAs are anti-catabolic, they can prevent muscle wastage during endurance exercise by creating a bigger pool of available aminos for energy use, so that muscle degradation doesn’t have to occur. 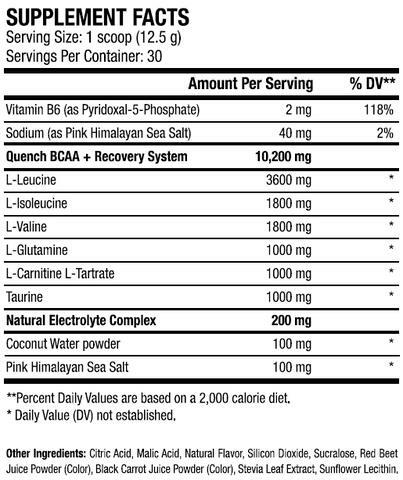 Directions: As a dietary supplement, mix 1 scoop (12.5 g) of QUENCH with 8-10 oz of cold water. Shake well and consume during exercise on training days, or drink throughout the day on non-training days. Warnings: This product is only intended for healthy adults, 18 years of age or older. Do not use if you are nursing, pregnant or attempting to become pregnant. Consult with a licensed, qualified healthcare professional before taking this or any dietary supplement product. Immediately discontinue use and contact your healthcare professional if you experience any adverse reaction to this product. Use only as directed. Do not use if safety seal is broken or missing. KEEP OUT OF REACH OF CHILDREN.